In 2012 Legacy of Letters will again be a combination workshop and tour, but this time the emphasis will be on the former. The workshop, focusing on calligraphy, typography and letterpress printing, will take place over the course of a week at the Tipoteca Italiana Fondazione in Cornuda, Italy. The workshop will be supplemented by trips—during the week as well as before and after—to libraries, museums, churches and studios to look at examples of lettering in all of its manifestations: inscriptions from ancient Rome to the Fascist era, Renaissance manuscripts and incunabula, the typefaces of Giambattista Bodoni, 19th-century Italian wood type and more. 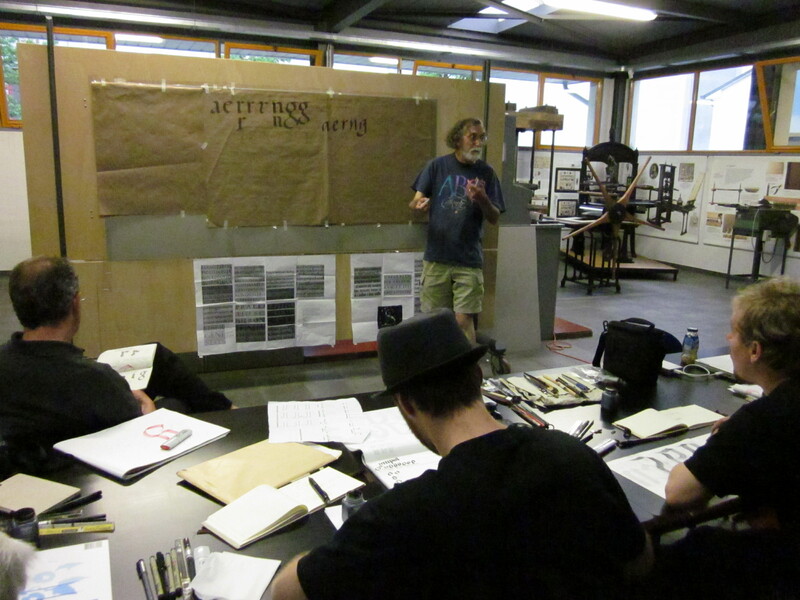 Paul Shaw teaching at the Tipoteca Fondazione Italiana during Legacy of Letters 2010. Photograph by Alta Price. During the workshop portion of Legacy of Letters 2012 participants will learn the history of our Western alphabet from Ancient Rome to the present; the tools and techniques of traditional broad pen calligraphy and contemporary expressive calligraphy; how to set metal type; and the fundamentals of letterpress printing using the Vandercook proof press. Paul Shaw will give illustrated lectures on the evolution of Western scripts accompanied by pen-and-ink demonstrations. He will also teach the basics of traditional broad pen calligraphy. Luca Barcellona will offer a demonstration and presentation of his contemporary calligraphic work in the fields of fine art, fashion, and street art. Together, Luca and Paul will show participants how to use non-traditional tools to create expressive writing. Lucio Passerini will lead the typesetting and letterpress printing portion of the workshop. Under his guidance each participant will learn how to set type by hand. Then everyone will design, set and print a personal broadside using the Tipoteca’s typefaces—including their extraordinary collection of large wood types—and incorporating their own calligraphy, rubbings, drawings or photographs. Sandro Berra of the Tipoteca will assist students in printing their broadsides. At the end of this lettercentric workshop/tour everyone will come away with a printed keepsake displaying their newfound knowledge and skills. Participants do not need to know Italian since the workshop will be conducted in English and each of the instructors is, to varying degrees, bilingual. Alta Price, the workshop/tour coordinator, is a professional translator and will be present to interpret and assist participants between English, Italian, German, French, or Spanish as necessary. The workshop will take place at the Tipoteca Italiana Fondazione in Cornuda, Italy, a small town in the Veneto. The Tipoteca, established in 1995 (and opened to the public in 2002) is a museum of printing and type. It has an outstanding collection of printing presses, Linotype and Monotype casting machines, pantographs, type casters, papercutters and other equipment along with cases of foundry type, drawers of wood type, and a library of type specimen books and printing trade literature. Much of the type and the literature is Italian and thus will be unfamiliar to those with experience in typography and letterpress printing. 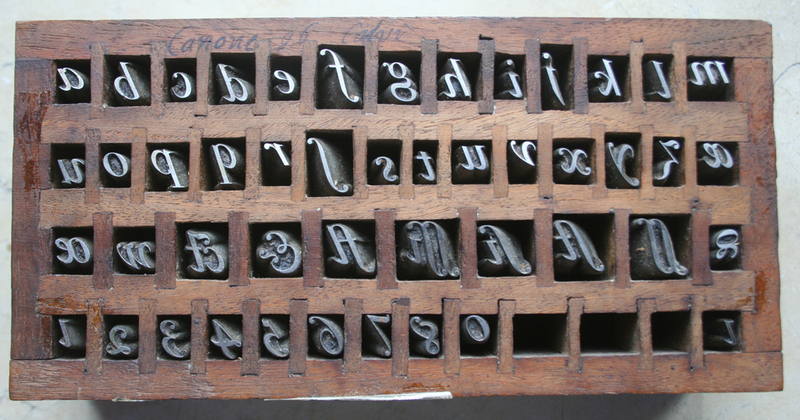 Punches for Calvi italic typeface cut by Giambattista Bodoni at the Museo Bodoniano, Parma. The hands-on workshop will be augmented by visits to libraries, museums and churches in various Italian cities to see Ancient Roman inscriptions, Medieval and Renaissance manuscripts, incunabula, and more. Legacy of Letters 2012 will begin in Milan with an orientation dinner. The next morning we will visit Il Buon Tempo, the studio of Lucio Passerini, and then have lunch with Lucio, Luca Barcellona and James Clough. Afterwards we will travel to Parma where participants will have free time to visit the Duomo, Battistero or just wander this lovely city. And there will be ample opportunity to sample the Parma’s famous cuisine which goes beyond its famous prosciutto and parmesan. The next morning we will visit the Museo Bodoniano and the Biblioteca Palatina to see the books, types, matrices and other equipment of Giambattista Bodoni. After lunch we will travel by private coach to Cornuda, home to the Tipoteca Italiana Fondazione, and our base for the workshop. Participants will be housed at an agriturismo that is within walking distance of the museum. 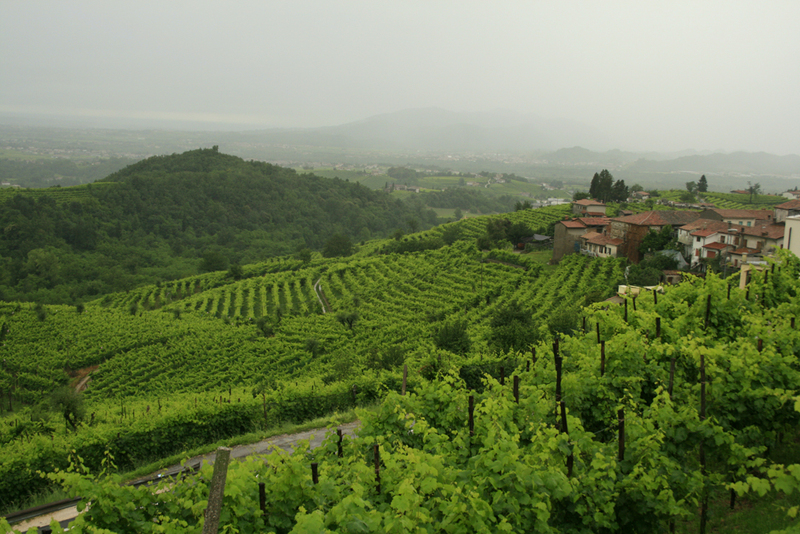 The surrounding region, the foothills of the Alps, is the heart of prosecco country. There are excellent places to eat in the countryside and Sandro, who knows them all, will choose one as the site for a special workshop dinner. During the workshop we will take two trips, one to Aquileia and one to Venice, to get inspired by lettering of the past. Prosecco vineyards in Valdobbiadene near the Tipoteca. Photograph by Carlo Scherer (2010). “A danger is that we restrict our view of imperial letters to a few select examples, notably the Trajan inscription,” wrote Father E.M. Catich, author of The Origin of the Serif. “One should broaden one’s view of the cultural forces that produced the excellent few inscriptions.… Aquileia has the best Republican inscriptions I’ve seen. A ﬁne collection of Imperial inscriptions as well.” We will visit Aquileia to see not only Republican and Imperial Roman inscriptions but also early Christian ones. And to see an astounding floor mosaic in its 4th-century Basilica. On a different day we will travel to Venice to visit the Fondazione Cini where we will have a leisurely opportunity to examine manuscripts, writing books and incunabula up close. Jenson, Aldus Manutius, Arrighi and more. After that there will be time for participants to see some of the famous sights—San Marco, the Accademia, the Doge’s palace, the Rialto bridge, the church of the Frari and more—of this enchanting city on their own. After the conclusion of the workshop at the Tipoteca, Legacy of Letters 2012 will conclude with a visit to Rovereto and Verona. In Rovereto we will see the diverse work of Futurist artist and graphic designer Fortunato Depero at the Casa Depero. In nearby Verona we will celebrate the end of the 2012 Legacy of Letters tour with a special dinner with one of the area’s renowned private press printers as our guest. Legacy of Letters 2012 will be serious but fun. Work will be balanced with play. Along with the lectures, demonstrations, classwork and trips to libraries and museums there will be delicious food and ﬁne wine to savor, and historic cities and beautiful countryside to enjoy. It will truly be a print trip. The price of the biennial 2012 Legacy of Letters Workshop & Tour is $3800 ($3500 for students). The tour price includes all hotels, breakfast, special dinners, buses and other ground transportation, museum and other admission fees. It does not include the cost of air travel to and from Italy or meals other than those specified above. The price is based on single-room occupancy. (If two participants are willing to share a double room a discount of $125 per person can be arranged.) For the workshop/tour to take place there must be at least six participants, but registration will be capped at twelve. Download the registration form. Fill it out and send it by e-mail to paulshaw@nyc.rr.com or by post to Paul Shaw, 785 West End Avenue, New York, NY 10025 USA. To reserve a place a non-refundable deposit of $350 is required. The balance is due by May 1, 2012. Payment can be made via PayPal or by check (drawn on a United States bank and made out to Paul Shaw / Legacy of Letters). Checks should be mailed to: Paul Shaw / Legacy of Letters, 785 West End Avenue, New York, NY 10025 USA. Questions about the Legacy of Letters workshop & tour should be directed to Paul Shaw at paulshaw@nyc.rr.com. In the event there are not enough participants the fee, minus the deposit, will be returned by July 15th, 2012. Note: the next Legacy of Letters Workshop & Tour will take place in 2014. Paul Shaw is widely known and respected as a guide to urban lettering. With Garrett Boge he co-founded and led the original Legacy of Letters tours of Rome, Florence and Tuscany from 1997 to 2000. On his own he has conducted regular walking tours of lettering in New York City since 2005 for the Type Directors Club and other organizations. He has led similar tours of Boston, Buffalo, Atlanta and Los Angeles for SoTA (the Society of Typographic Aficionados). Paul has been a calligrapher for over 40 years and has designed 18 typefaces. He teaches calligraphy at Parsons School of Design and the history of typography at the School of Visual Arts. In 2002 he was a Fellow at the American Academy in Rome. He has written about calligraphy, lettering and type for Letter Arts Review, Print, Eye, Baseline and other magazines. Alta Price runs an editorial consulting and translating business specializing in art and architecture texts. She has translated texts on objects ranging from Caravaggio to contemporary sculpture, Egypto-Armenian photography, and the vertiginous nature of list-making. Fluent in Italian, she is also well versed in German, Spanish, and French. Alta became enamored of epigraphy, paleography, and lettering of all sorts while living in Rome and studying papermaking. She holds a bfa in Printmaking and Art History from the Rhode Island School of Design and an mfa in Combined Media from Hunter College. Her artistic practice spans the gamut from paper and watermark-making to collage, stop-motion animation, and book objects. Luca Barcellona has his own studio in Milan, where he works as a freelance graphic designer and calligrapher. Letters are the main ingredient of his creations. He teaches calligraphy for the Associazione Calligrafica Italiana and conducts workshops throughout Europe. In 2003 he founded the collective Rebel Ink with Rae Martini and Marco Klefisch, devoted to the live demonstration of calligraphy, writing and illustration. His clients include Carhartt, Nike, Mondadori, Zoo York, Dolce&Gabbana, Sony BMG and Volvo. Luca’s work has appeared in a number of design publications including Letter Arts Review, Calligraphy and Graphic Design by Marco Campedelli, Playful Type 2, Arabesque 2, and Los Logos 5. Lucio Passerini has been a printmaker in Milan since 1974 and a letterpress printer since 1982. He has dedicated himself to conceiving and making small, limited edition books devoted to typography and art. They are published under the name Il Buon Tempo. His prints, principally woodcuts and linocuts, have been included in numerous international exhibitions. He has won prizes at Biella (1993), Frechen (1996), Xylon (1997), and Cairo (2000). Lucio is the author of Xilografia, i materiali, le tecniche, la storia della stampa a rilievo (Xylography, the materials, the techniques, the history of printing from woodcuts). James Clough studied typography at the London College of Printing. Now based in Milan, he collaborates with Italian and international publishers and agencies in the fields of typographic design and calligraphy. He teaches the theory and history of typography in various universities including the Politecnico di Milano, the Università Cattolica di Milano and SUSPI (Scuola Universitaria Professionale della Svizzera Italiana) in Lugano, Switzerland. He has also lectured in Great Britain, the USA and Turkey. He works with Italian museums such as the Tipoteca and the Museo della Carta di Fabriano. He writes on the history of typography and the graphic arts for Italian and international publications on calligraphy. Sandro Berra is the coordinator of the Tipoteca Italiana. He edited A story of character: ten years of Tipoteca Italiana and is co-editor of the journal Tipoitalia.